Built in 1943, this 1632-square foot Sugar House brick bungalow features four bedrooms, two bathrooms and an almost complete basement with separate walkout. But what sets this home apart from so many in the coveted area is its TWO kitchens – one on the main living floor and one in the basement. It poses endless possibilities and avid bakers, hungry sporting enthusiasts, extended family and entrepreneurial minds alike will all be champing at the bit to utilize the additional kitchen to their preferred usage. With Summer upon us, the backyard’s spacious and well maintained deck and patio is shielded by a canopy of mature trees and is the perfect place to while away the extra daylight hours, taking in the mountain views from the east. Situated close to Granite School District, this adorable home is freshly painted in a mix of neutral and mood-enhancing colors and features French doors leading from the combined living/dining area out to the aforementioned deck. Flooring throughout includes a combination of hardwood, carpet and tile. Positioned on a corner lot, privacy is afforded by a wraparound, high timber fence and mature fruit and pine trees. A detached, one-car garage and separate storage shed are positioned in the backyard and accessed via the side street, and a large grassed area awaits your development/landscaping ideas – pool, cabana, studio? So let’s get cooking on this one. 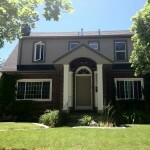 Call Brad at Muve Group today on 801.230.5236 to schedule your viewing.